The English admonition, “Good fences makes for good neighbors” exists in many other languages. A moment’s reflection reveals that fences and walls to divide off peoples have been going on for millennia. There’s nothing particularly new about the fence between the US and Mexico, the Cold War wall between East and West Germany, or the one between Israel and the Palestinian West Bank. Look at the Great Wall of China. The Mexicans know from their history that development is the cure for migration. Thanks to economic growth the Mexican exodus to America has been reduced to a trickle. Trump doesn’t talk about this. He goes on using the Mexicans as a scapegoat for a phenomenon that no longer exists. In his election campaign he said, “They’re bringing crime. They’re rapists.” Now he is using the caravan to win votes in the coming mid-term elections. Ever since the Kissinger Commission that evaluated Central American needs at the end of the local civil wars in 1984 there has been talk of the need for the US to give significant amounts of aid to get these countries out of the rut of poverty. But not much has been forthcoming, although when it does arrive it often produces sterling results. For instance, Trump should concentrate on aid endeavors like the farm project in El Salvador run by the International Fund for Agricultural Development that is doing really well. 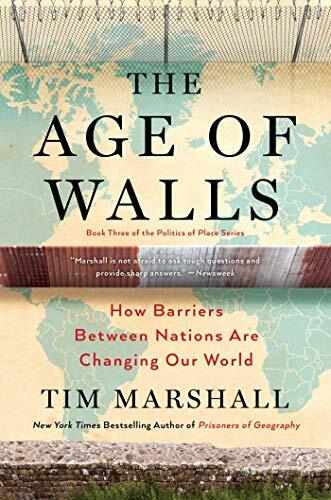 According to a new well-researched and perceptive book The Age of Walls by Tim Marshall, each wall tells a story. On India’s frontier with Bangladesh is the longest border fence in the world—2,500 miles of it. It was built primarily to stem the exodus of poorer Bangladeshis to better-off India. But now fast developing Bangladesh is richer per head than India, and the wall is becoming an anachronism. India has another fence: the 340-mile long barrier along the disputed line of control inside Kashmir, a region both India and Pakistan say is their territory. “It stands as a fortified monument to the enmity between two nuclear-armed nations,” writes Marshall. Western Europe, belatedly, has joined the fence builders. The Syrian war migrant crisis of 2015 prompted a wave of nationalism, particularly in Eastern Europe. Rather than agree to “burden-sharing,” which if it had been imposed would have given each EU country only a modest number of migrants each, these countries preferred to decline, taking in barely a handful. Hungary built fences along its border with Serbia and Croatia. Slovenia erected a fence along its border with Croatia, Macedonia along its Greek border, Austria along its border crossings with Slovenia and Italy. The fences have insured that the Mediterranean countries where the refugees land have had to bear the most heavy load. Now the Syrian migration has been reduced to a trickle and African migration, except to Spain, has slowed dramatically, but still the fences remain. Like Trump, right wing politicians in Europe (including the Brexit supporters in the UK) raise the specter of endless migration. But it’s unlikely there will be more large-scale wars in the Middle East. Even the one remaining, Yemen, has produced few refugees Europe-bound. The African stream is over-magnified. Observers talk about Africa’s population increase and how this must inevitably lead to more northward migration. But it has been going on ever since the early 1970s in fairly modest numbers, even though the rate of population growth was much, much higher before than it is now. There’s still time to help Africa develop at a faster rate than it’s doing (much of it is doing rather well) and turn it into another Mexico where there are jobs and people prefer to stay at home. As for those migrants who do make it, most Western governments, too belatedly, have realized that their policy of multiculturalism has not worked. It has led to ghettoization. For immigration to have fewer bad effects it has to be carefully planned integration. Fences and walls are not necessary. Mostly they are manifestations of superficial thinking.